Two schools namely Avatea in the boy’s division and Nikao in the girls division stamped their dominance against their opponents for a comfortable win with Avatea notching ten unanswered goals against Titikaveka while Nikao jotted seven unanswered goals against Imanuela. Although Avatea and Nikao recorded high scores Avarua senior students in both divisions controlled their matches and securing their first wins by beating Nukutere in a total of eleven goals against Nukutere’s one goal. Excitement and nail biting tension was evident in the boys division match between Nikao and Te Uki Ou/Imanuela, Nikao scoring first however it was short lived as Te Uki Ou/Imanuela equalized late in the first half much to the thrill of the teachers and parents. Nikao tried tirelessly to score another goal to lead the match but failed to score, however with seven minutes remaining Te Uki Ou/Imanuela scored their second goal and sealed their win over Nikao as students celebrated amongst each other. 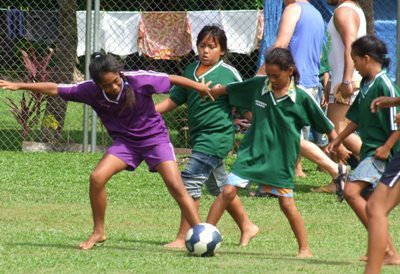 In the other matches played, in the girl’s division Arorangi managing to put one goal over Titikaveka and taking their first win while in the boy’s division Papaaroa winning their match, scoring two goals to one against opponents Arorangi.